But also it's not too hard of a workout, very basic. You don't have to know how to clean, which I don't have the hang of quite yet. 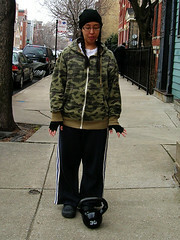 The only thing I do different is single leg deadlifts—instead of the pushup position hold a.k.a. plank for that third exercise. Not that planks aren't excellent, I have a floor series where I do all sorts of planks though. 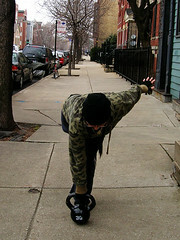 Single leg deadlifts are more in line with the rest of this workout, which to my mind is about dynamic core strength. 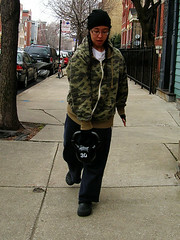 Stand straight with the kettlebell in front of, say, your left foot. Bend forward and grab the kettlebell with your right hand. 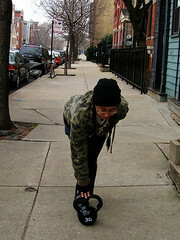 Bend forward and set the kettlebell down in front of your left foot. Then stand up and slightly adjust your position so that the kettlebell is in front of your right foot, and repeat on the other side. I started with my 20# kettlebell for all this workout, and it was totally right to get a thirty pounder as a ninth present. I wasn't sure that I could manage thirty pounds for the halos with my little T-Rex arms, but it just takes more focus. Which is all good, for the whole workout. I'm finding that using the heaviest weight that I can possibly manage makes sure that I don't cheat—i.e., compensate with my dominant muscles; if low belly doesn't join in, that kettlebell is not getting off the ground and that's that. If you want to do this as a proper workout, do three complete sets back to back. I do one set as a pomodoro break, probably 3-5 sets in any given afternoon.